For all kinds of naughty hair. Barnet a bit bedraggled? Before you contemplate a (gasp!) quiet night in, try this. 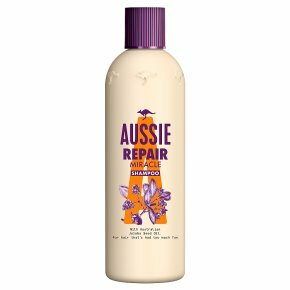 Aussie Repair Miracle Shampoo's special formula, with Australian Macadamia Nut Oil, Jojoba Seed Oil and Avocado Oil, transforms dry, damaged hair into manageable, shiny locks. So whatever you put your hair through, this handy little fixer will help restore it back to its former glory. Our miraculous hair-repair formula will bring our hair leaping back to life. Our special formula will breathe life back into dry, damaged hair. With Australian Macadamia, Jojoba and Avocado Oil. For damaged 'rescue me!' hair.Uh oh. Hair on its last legs? Don't panic! Our special formula, with Australian Macadamia Nut Oil, Jojoba Seed Oil and Avocado Oil, will breathe life back into dry, damaged hair. The magical combination of our super nourishing shampoo will transform even the most lifeless hair into soft, shiny, luscious locks. Boom! Massage shampoo into wet hair. Rinse. Follow with Repair Miracle Conditioner, especially if your hair really needs saving from the depths of despair.